Home style cooking at its best is our mantra. You are met at the door with our abundantly filled pastry cases. The shelves are filled with our homemade layer cakes, flaky pies, iced cupcakes, fruit crisps and so much more to tempt you on your way to a table. Our menus are prepared with fresh, local ingredients from the Hudson Valley area including: Hudson Valley Milk, Cage-Free Eggs, Organic Fair Trade Coffee, Grass Fed Beef & Farm Raised Meats, Poultry & Vegetables. Kitchenette can satisfy all your cravings whether it be an oasis from the cold with our own hot chocolate topped with a homemade marshmallow, or a steamy bowl of chicken soup or a hearty meal of turkey meatloaf and mashed potatoes. We are a home away from home. I would recommend they call and not use open table.. this restaurant doesn't use it! I've been eating for over 60 years, and cooking for over 45 of them, but I have never had better food than the fare at High Falls Kitchenette. Their service and atmosphere are always friendly -- and it's a darn fun place to be. I had the fried chicken and coleslaw. Both were excellent. I’ll come back next time I’m in the vicinity. The food is always good. The jazz group playing on Sunday, 11/11/18 was great & added to the fun vibe. Really enjoyed our visit and meals here! 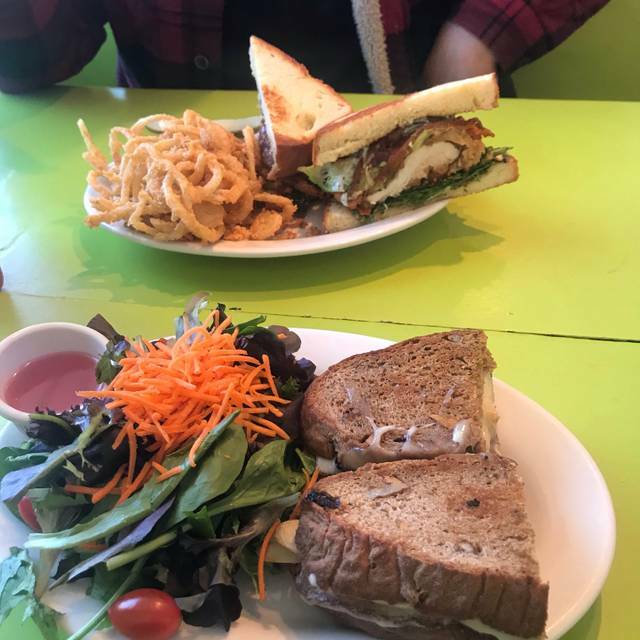 My boyfriend had the fried chicken BLT w/ avocado and I had the fancy grilled cheese. Both were a very generous portion size and delicious. I also had a Bloody Mary which was good! Delightfully delicious! Great people, nourishing food. We went there for a casual dinner as a group of 2 families. The food was good and there were plenty of options for picky eaters. Extraordinarily slow service, indifferent staff. Very disappointing after having such great experiences at their sister restaurant in Manhattan. Lovely spot for a hearty weekend breakfast/brunch! Menu is Southern, so expect generous portions and plenty of down-home flavor. Best onion rings I have ever eaten. The waitress was super friendly. The bread is baked there making anything you eat with bread a special treat. The chairs are uncomfortable metal and the building that houses the restaurant really needs some R&M even for that neck of the woods. Was it worth a two hour drive? Just maybe for those onion rings! Enjoyed our lobster. It was a little over cooked but still delicious. Our waitress was very nice but it is better to serve the cocktail before the soup. Still we will go back. We went there on St. Patrick's Day to avoid mayhem and atmosphere was perfect - some odes to SPD (green mimosas and green bloody mary's) but not crazy. Owner and staff were attentive and fun. Apps through dinner all tasty. And solid beer selection to boot. p.s. we love Kitcheonette for breakfast! and the baked goods are awesome! We had a wonderful time and will be back soon! The baked cod was fabulous! I highly recommend it! Great service, good comfort food & great desserts. Satisfies comfort food brunch cravings - high quality food and good coffee. Seems like they bake the breads in house which are good, but definitely thick-cut and filling. As a bread lover, I thought the bread was actually too heavy and did not elevate the food. But see for yourself, mostly can't go wrong with any of the selections on the menu! Nice staff, who make occasional mistakes but are friendly and prompt in remedying them. Basically, most things are at least good, some very good-- like the sweet potato fries. Nouvelle comfort food but not too unhealthy selections abound. Very fun place. They have a ramp up to the porch BUT always have an outdoor table placed so that wheelchairs can;t easily get by. That is easily remedied.Bathrooms are cute but also not good for disabled patrons. It's worth the very winding drive (on a lovely country road) from the college town of New Paltz to get to the hamlet of High Falls and Kitchenette. The food was incredibly fresh, and delicious. Loved the cumin fried calamari. The hummus and the couscous on the Kitchenette Salad made it special, as did the slightly sweet pieces of toasted pita. My husband's mushroom/onion burger was juicy, on a home-baked brioche bun, served with copious fries. His margarita had a great pop. Next time we'll be back for the house-made desserts. Rustic country decor, but not "cutesy," and indoor and outdoor seating. This was our last family meal of the vacation. We were placed in a weird "U" shaped multi-table configuration that had some of the party with their backs to the others. The place was freezing so most of us kept our coats on. The menu is comfort food focused and I ordered the cheesy grits bowl with bacon and eggs with a buttermilk buscuit on the side. The grits were runny and not cheesy. Overall the food was ok. The coffee was good. But given our 30 minute drive I think we will be finding a better option next year. Amazing food and ambient. Very cozy and pleasant and service is professional. I had a great time and will go again. Great theming! Food is extraordinarily flavorful and well prepared. Creative comfort food and outstanding cocktails. For example, the fried pickles are made with house made pickles which puts them way over the top. The buttermilk fried chicken was crispy and had a perfect balance of batter to meat and the mac and cheese was very cheesy and made for the adult palate. All the ingredients were clearly fresh and top quality. Beautifully seasoned and presented in theme. Only complaint is that we didn't leave room for dessert! We'll be back! I love The Kitchenette! Always fantastic food and great service. Roaming the countryside and came upon the small hamlet of High Falls and a wonderful little place to stop and eat lunch. The food was terrific. My spouse had chicken and waffles and I had Mac & Cheese and a vanilla shake. Delicious! The waiter was a gentleman. Great customer service. I would never have found it without my opentable ap on the iphone! We picked this restaurant because it was the only place open at 9am in the vicinity of Woodstock that could accommodate 9 people. Our family had spent the week upstate and this was the last brunch together before we all headed back. The restaurant was great. Good home cooked comfort food options for brunch and good service. Also very amenable for kids and for vegetarians the menu offers nice options. We will be back. In fact it may become an annual tradition as our last meal of the vacation! Killer old school comfort food just about anything you can imagine and if you still wanna keep it clean you can get a great kale salad...... a real gem for the Hudson Valley and a nice alternative when you just don't want fussy food....yeah. Really great local brunch spot! My husband and I make this our Sunday go to spot when we are travelling upstate. We had a large party for brunch and the waiter was very good, service was prompt and the food was excellent. 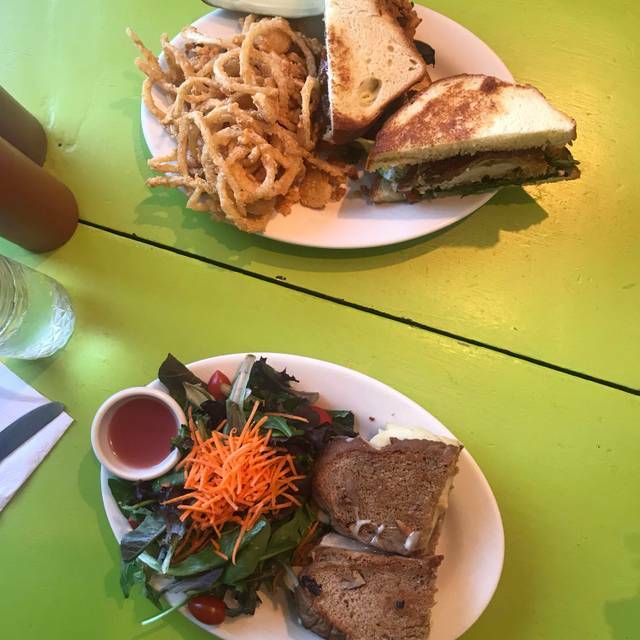 Kitchenette is a breath of fresh air for High Falls! Attentive and friendly staff, big menu and very kid friendly. They serve breakfast, lunch and dinner. Portions are good, prices very fair. Favorites are: pork Chops, Chicken pot pie topped with a giant Cheddar biscuit, potato panCakes, MAC & Cheese and the turkey Club. Leave room for dessert! lemon bars, Cup Cakes, mini-pies and Cold pudding in a mason jar topped w/whipped Cream or Carrot cake in a jar. They can aCComodate larger groups, which makes it great for special events. Looking forward to our next meal there.